The ads that emerged, a sampling of the 3,000 that Russians bought during the 2016 presidential campaign and its aftermath, demonstrated in words and images a striking ability to mimic American political discourse at its most fractious. The targeting information also showed a shrewd understanding of how best to use Facebook to find and influence voters most likely to respond to the pitches. As a group, the ads made visceral appeals to voters concerned about illegal immigration, the declining economic fortunes of coal miners, gun rights, African American political activism, the rising prominence of Muslims in some U.S. communities and many other issues. Some of the ads, many of which were bought in Russian rubles, also explicitly called for people to attend political rallies amid a campaign season that already was among the most polarizing in recent U.S. history. They were targeted to many types of Facebook users, including professed gun lovers, fans of Martin Luther King Jr., supporters of Trump, supporters of Clinton, residents of specific states, and Southerners who Facebook's algorithms concluded were interested in "Dixie." 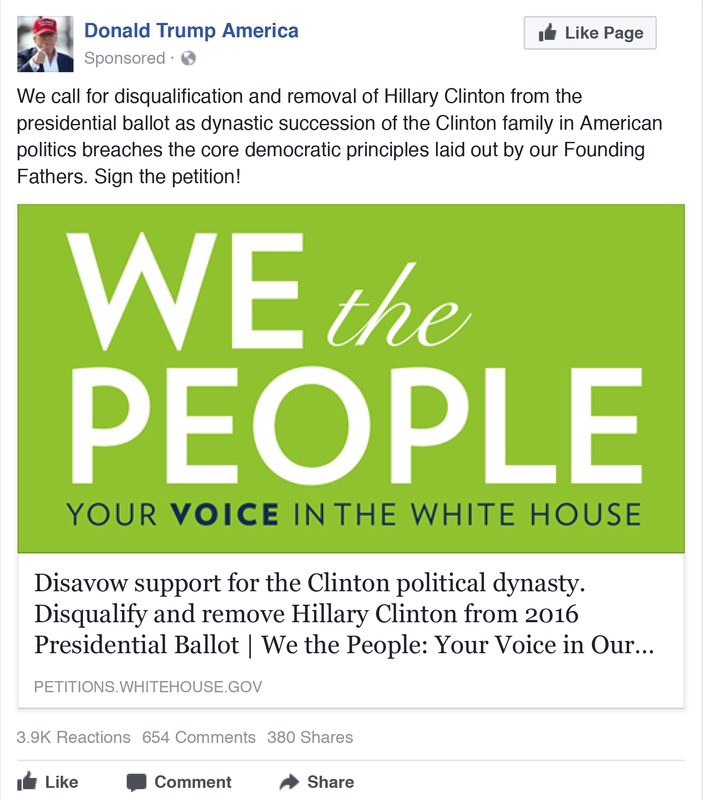 One ad, from a phony group called Donald Trump America, touted a petition to remove Clinton from the presidential ballot, saying, "Disavow support for the Clinton political dynasty." Another ad, from a Russian-controlled group called Heart of Texas, announced a rally to take place May 21, 2016, under the banner of "Stop Islamization of Texas." A separate Russian-controlled group, United Muslims of America, publicized a competing rally to "Save Islamic Knowledge" at the same place and time, prompting two groups to face off in competing demonstrations in Houston — a sign of how Russians hoped to turn divisions into open conflict. This crossover of online influence to real-world consequences was among the issues raised in contentious Capitol Hill hearings Wednesday as lawmakers scolded attorneys for technology companies they said did not do enough to thwart Russian disinformation. "I don't think you get it," said Sen. Dianne Feinstein (D-Calif.), whose home state includes the headquarters for Facebook, Google and Twitter. "What we're talking about is a cataclysmic change. What we're talking about is the beginning of cyberwarfare. What we're talking about is a major foreign power with sophistication and ability to involve themselves in a presidential election and sow conflict and discontent all over this country. We are not going to go away, gentlemen. And this is a very big deal." Facebook disclosed in September that it had discovered more than 3,000 ads bought by 470 accounts and pages run by a Russian troll farm in St. Petersburg. All those accounts have now been shut down, and the ads were provided to congressional investigators. The ads released Wednesday cover only a small part of how the Russians targeted Americans on Facebook and other American-owned social media platforms such as Instagram, Twitter, ­YouTube and Pinterest during the 2016 presidential campaign. The biggest impact, several independent researchers have said, was through ordinary free posts by Russian-backed Facebook groups. Those posts reached up to 126 million Americans, Facebook said, far more than the 11.4 million who saw the ads. These Facebook ads, like several others that had emerged in news reports over the past several weeks, had the apparent goal of needling Americans' cultural sore spots. "The strategy is to take a crack in our society and turn it into a chasm," Sen. Angus King (I-Maine) said during the Senate Intelligence Committee hearing. Those sharp words came on the same day that Facebook reported another surge in profits in its third quarter. The social network earned $4.7 billion, a 79 percent increase from the same period last year. Addressing the controversy in a letter to investors Wednesday, Facebook chief executive Mark Zuckerberg acknowledged that new investments in security would affect the company's bottom line. Facebook said this week that it has 10,000 employees and contractors working on safety and security issues and will double that number by the end of 2018. "We're investing so much in security that it will impact our profitability," Zuckerberg wrote. "Protecting our community is more important than maximizing our profits." Three ads from a group called Stop All Invaders showed photos of a woman wearing an Islamic religious head-covering, along with calls to action to stop the spread of sharia law. "All face covering should be banned in every state across America!" read one ad that had been shared more than 4,300 times and drummed up 14,000 likes. Another Facebook ad promoted a "Down With Hillary!" rally in July 2016 outside Clinton's campaign headquarters in Brooklyn. The ad was targeted to Facebook users 18 to 65 years old who had declared interest in Trump or Donald Trump Jr. and lived within 25 miles of New York City. 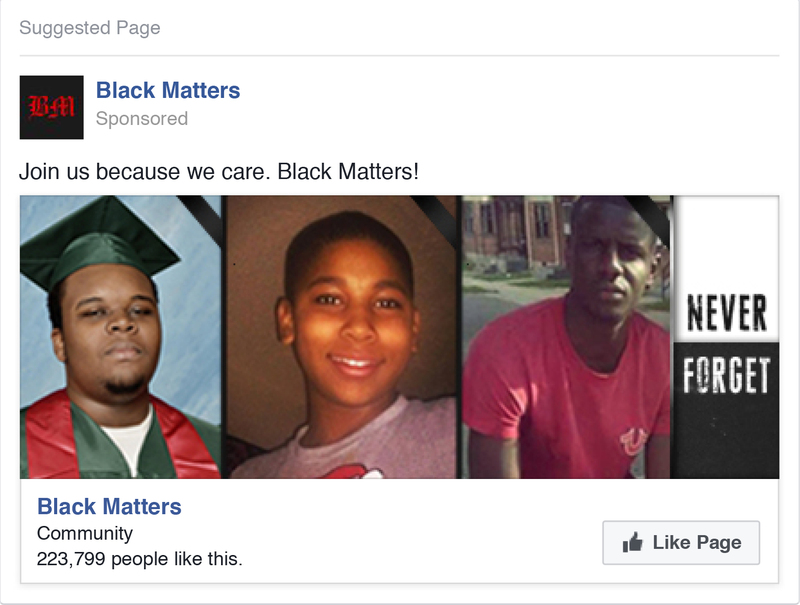 Yet another ad targeted the other end of the political spectrum with the creation of a "Black Matters" community page, mimicking the language of the popular Black Lives Matter movement. The Black Matters page featured pictures of African American males killed in high-profile police shootings, including Michael Brown, shot in Ferguson, Mo., in 2014, and Tamir Rice, a 12-year-old boy shot by Cleveland police that same year. The ad was targeted to a number of groups, including people who declared an interest in Martin Luther King Jr., BlackNews.com or HuffPost Black Voices. A similar ad from a group called Blacktivist showed a black-and-white photo of militant Black Panthers with the words: "never forget that the Black Panthers, group formed to protect black people from the KKK, was dismantled by us govt but the KKK exists today." It targeted people who had declared on Facebook an interest in African American culture or Malcolm X. It was seen by nearly 300,000 people, according to Facebook data. More than 13,300 people clicked on the ad. Both Facebook and Twitter say Kremlin-linked organizations used their platforms to try and influence voters during the 2016 election. Here's how. Another ad, also bought by the Heart of Texas group, took particular aim at veterans and others concerned about military issues, saying, "Hillary is the only one politician (except Barack Obama) who is despised by the overwhelming majority of American veterans." The Russians targeted firearms enthusiasts with a "Defend the 2nd" page, a reference to the Second Amendment guarantee of Americans' right to bear arms. This ad was targeted to fans of the National Rifle Association, Gun Owners of America and Guns & Ammo magazine, among others. It was seen by 300,000 people. Nearly 100,000 of them hit a Facebook "like" button signaling support for the page. The promotion cost was 48,305 rubles, less than $900. Lawmakers also released a list of Twitter account names that were used by Russian operatives. The names seemed designed to sound like those of Americans, both ordinary and prominent, such as 4claireevans, 2lauragibson, and _GeorgeSchultz_. In Wednesday morning's hearing, Sen. Mark R. Warner (Va.), the ranking Democrat on the Intelligence Committee, cited a free post by a Russian-controlled account called Army of Jesus depicting Clinton dressed as Satan, with red horns and boxing gloves, appearing to punch Jesus, who also was wearing boxing gloves, as well as a determined glare as heavenly light appeared above him. "'LIKE' IF YOU WANT JESUS TO WIN!" the post said, using the terminology of Facebook as it tried to get users to publicly declare their interest in groups, events or products. People who hit "like" buttons on Facebook can later be shown ads related to those subjects. 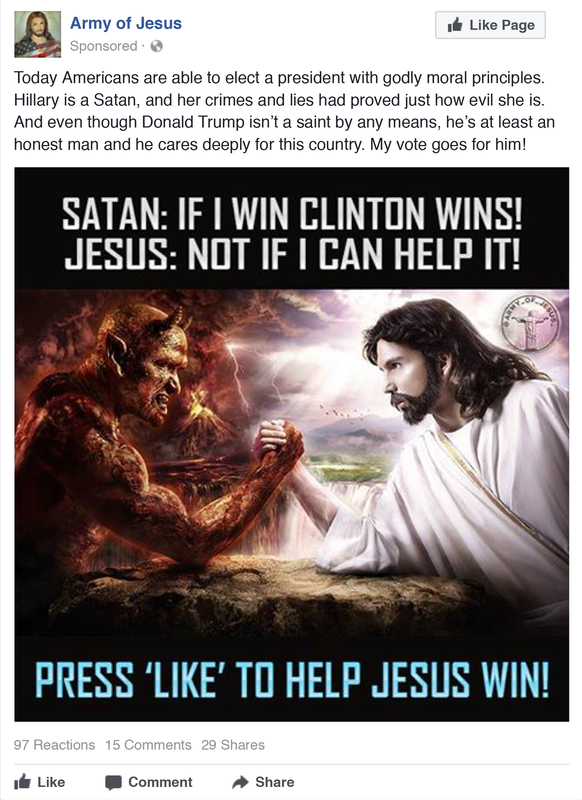 The group Army of Jesus also bought an ad that featured Jesus and Satan arm-wrestling, quoting the devil saying, "IF I WIN CLINTON WINS!" Lawyers for Facebook, Google and Twitter all denounced the Russian campaign in the congressional hearings and vowed to keep investigating and sharing what they find. Facebook's general counsel, Colin Stretch, called the Russian effort "vile" and "reprehensible" in various hearings. The lawyers also repeatedly sought to portray the Russian content as a tiny part of the overall flow on their platforms. But lawmakers from both parties repeatedly sought to make clear how important they considered the online influence campaign. "This isn't about re-litigating the 2016 U.S. presidential election," said Sen. Richard Burr (R-N.C.), chairman of the Senate Intelligence Committee. "This isn't about who won or lost. This is about national security. This is about corporate responsibility. And this is about the deliberate and multifaceted manipulation of the American people by agents of a hostile foreign power." Many ads were paid for using the Russian payment platform Qiwi, documents from the lawmakers showed. Qiwi is the Russian equivalent of PayPal and has worked with Visa to create a joint virtual card. Technology lawyer Albert Gidari, director of privacy at the Stanford University Center for Internet and Society, said that in turning over the ads, companies were entering complex legal territory. Ads have long been considered private data on par with email content and other records that the government must have a search warrant to obtain, he said. That includes ads published by foreign governments or even terrorists. The tech companies, he said, had probably made the calculation in this case that the risk of subjecting themselves to the ire of lawmakers and potential regulation was worse than the risk of being sued by Russians, but the negative consequences of that choice could be felt down the road. "These are huge mistakes with consequences that far outweigh the benefits because they make us feel better about how Russians interfered in the election," Gidari said. "It turns the platforms into agents of the U.S. government to decide what people should like or not like, read or not read. This is bad policy in the U.S. and even worse abroad." Todd C. Frankel and Hamza Shaban contributed to this report. Craig Timberg is a national technology reporter for The Washington Post. Since joining The Post in 1998, he has been a reporter, editor and foreign correspondent, and he contributed to The Post’s Pulitzer Prize-winning coverage of the National Security Agency. Adam Entous wrote about national security, foreign policy and intelligence. He left The Washington Post in December 2017. He joined the newspaper in 2016 after more than 20 years with the Wall Street Journal and Reuters, where he covered the Pentagon, CIA, White House and Congress. Karoun Demirjian is a congressional reporter covering national security, including defense, foreign policy, intelligence and matters concerning the judiciary. She was previously a correspondent based in The Post's bureau in Moscow.